Gene Simmons says he has no inclination to record a new Kiss album. The band’s last studio release was 2012’s Monster and the bassist and vocalist says it’s hard finding time to record new material – and people would just illegally download if they did. He tells Canton Rep: “We’re so busy touring around the world, and people in America might not know it, but we just came back from Japan and we’re going to Europe in May. We start in Moscow May 1. 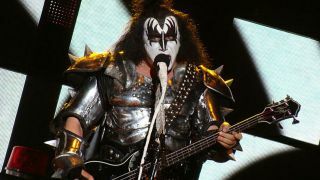 The Kiss star has also lined up a solo show at the Agora Theatre in Cleveland on March 18, which will coincide with his appearance at the city’s Wizard World Comic Con that weekend. Simmons continues: “This is gonna be a first for me. Outside of Kiss, I’ve never done a solo tour. I never did anything like that. Every once in a while I’ll jump up on stage and do a song with somebody. Johnny Depp and I did a few songs together, a few other knuckleheads, but that’s about it. “When Wizard World and I agreed to do five events together, the idea of jumping up onstage and gulping it on for an hour or so came up. Last week, the band’s Paul Stanley ruled out the possibility of former guitarist Ace Frehley returning to the fold after months of speculation. Ahead of their tour Russian and European dates, Kiss have a pair of shows in the US planned for late April.